PROPS SET for POSER-DAZ Standard Characters. CHARACTERS NOT INCLUDED. [DAZ is a free Software]. _______________________________________ Roman Gladiator Provocator 14 HD props. All 3D models for POSER James, Simon G2, Ryan and free DAZ Michael 4, Jeremy Genesis. Faithful Reconstruction. C4D, 3DS, OBJ, POSER, DAZ, VUE6to12! _______________________________________ Roman Gladiator Provocator [Gladiator G]. A regular opponent to the Hoplomachus or to another Provocator. Provocator means 'the Provoker' or 'the Challenger': this Gladiator used to dance, jump and fly against his opponent, in order to make him lose his temper. This gladiator was the only one to regularly carry a breast plate as protection. It seems that also women were accepted in this type of Gladiatorial combat typology [i.e. probably Provocatrices]. Real World Scale Model [Real World System]. Quads [C4D; OBJ; POSER/DAZ] & Tris [VUE;3DS]. SmartCgArt is member of the Archaeological Institute of America-AIA. Collection of 14 3D Models with 134 Photoreal and Alternate textures. 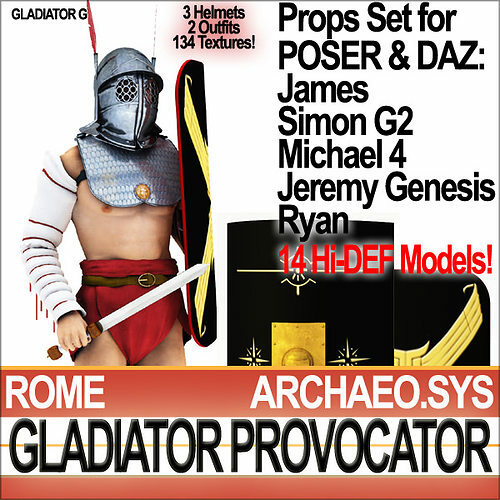 5 complete Props Sets ready to be used with POSER [James, Simon G2, Ryan] and DAZ [free Michael 4, Jeremy Genesis characters][DAZ is a free Software]. Faithful and accurate Reconstruction of a Roman Gladiator Provocator [Gladiator G] Props Set, as from remains and evidence. Two provocatores could fight against each other. Provocator used his typical Shield Scutum type B or the classical Shield Scutum A.
Gladiators usually fought without using shoes, but they could use them. The Institution of Gladiatorial Games lasted ca. 1000 years. The first recorded games in 264 BC. They were definitively banned in 681 AD. In the package you will find: 1- 1 HD typical Provocator Helmet A with feathers; 2- 1 HD typical Provocator Helmet B without feathers; 3- 1 HD typical Provocator Helmet C with feathers; 4- 1 Metal Breast Plate Kardiophylax; 5- 1 Short Greave; 6- 1 typical Gladiator Shield Scutum A used also by Provocatores; 7- 1 typical Provocator Shield Scutum B; 8- 1 Gladiator Kilt type B with Belt; 9- 1 Gladiator Kilt type D with Belt; 10- 1 Gladius Pompeianus; 11- 1 Lorica Manica; 12- 1 Padded Leg Guards; 13- 1 Pair of Shoes [Carbatina type]; 14- Complete SET ready for POSER 6 and Up JAMES character; 15- Complete SET ready for DAZ free MICHAEL 4 character; 16- Complete SET ready for POSER 7 and Up SIMON G2 character; 17- Complete SET ready for DAZ free JEREMY GENESIS character; 18- Complete SET ready for POSER 8 and Up RYAN character; 19- 134 Hi-Quality Hi-Def PhotoReal Textures [2050x2050; 1366x512; 1000x1000; etc. ]; 20- Alternate Textures to create different types of elements; 21- 8 special Metal Textures; 22- Txt tutorials for Poser/Daz Animation and Correct Rendering; 23- Real World Scale SmartCgArt Man Reference System with models [C4D, VUE, 3DS, OBJ, DXF]. Enjoy THE ARCHAEO.SYS 3D SERIES.